The Garden Hall is a spacious, modern hall, which opened in 2003. The hall has won architectural awards, and one side is completely of glass. 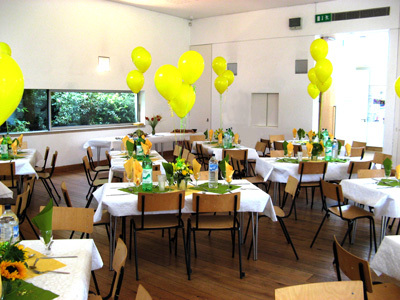 The hall is available for private hire and is the perfect venue for parties, classes, meetings and events. The main room dimensions are approximately 39ft x 34 ft, and it has a maximum capacity of 200 people standing. There are 120 chairs and 16 tables which seat 6 (enough tables to allow 96 people to be seated for a meal). The tables measure 2ft 6ins. by 5ft. Although most hirers find our tables suitable for children, should you wish to hire smaller tables and chairs, they must be delivered and collected within the period of your hire. A kitchen with full cooking facilities and crockery is available to hirers. There is a hob, oven, fridge, microwave, kettles and an urn. The dishwasher has a very fast cycle, but its instructions should be read carefully by users, who should then empty it and return items to their original locations please. The hall has plates, bowls, mugs and some cutlery although no glasses. 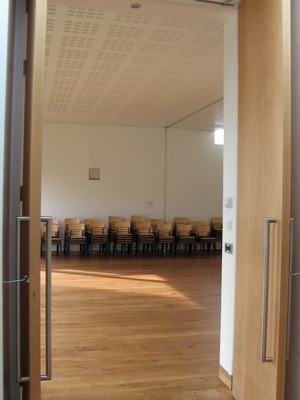 The hall is fully accessible, and has toilet facilities for the disabled. We have a grassed area outside which can be accessed through the main doors from the lobby. We regret that we do not allow any teenage parties in the hall. Wedding receptions may only take place if there is no service taking place in St Mary's Church at that time. For more information and details of hiring rates and how to book, please see the planning your event and booking information pages.